Now, an old steel Kona is just too pretty to confine to the loft. The situation provided an ideal opportunity to fulfil two pet projects in one hit - a 'retro' build and a fixed wheel MTB. I'd actually built the fixed 26" wheels a few months earlier from a Kogswell hubset, but the 'Shed', the bike that they were adorning hadn't really inspired me to ride it much. Certainly I never enjoyed taking it offroad. 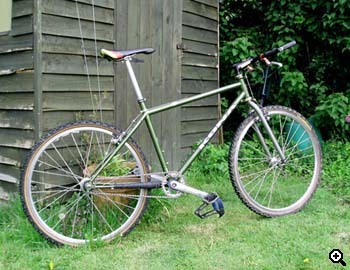 So I set about restoring the old Kona, with the help of eBay, the Singletrackworld classifieds and generous friends, to something more akin to its original vintage. XTR cantis, Real brake levers, Kona Racelite seatpost, Velocity stem, P2s, Control Center headset & Chill Pills made all the difference! My favourite find, though, has to be the very narrow USE bar/bar-end combo that feels much better than it really ought to. 1.5" Conti XCs on Mavic hoops top it all off nicely -- a good compromise between dirt and tarmac. I have to say, it looks far more appealing to ride than its predecessor. Those flats and straps mean that, if I just want a pint of milk (or a pint of Guinness) I can jump straight on it without having to faff about with cycle specific shoes. Re-learning to flip the strap has been fun, too, in a challenging don't-look-down sort of way! So, how does it ride? You'll be pleased to hear that it's just like a bike - whippy, super light, stretched out and fun. I'm starting easy mind, just cruising into town or spinning up and down the towpath, all the while silently chanting the fixie mantra 'just keep pedalling, just keep pedalling'. The 32:15 setup that fits the chainstay length feels just about right -- very slightly taller than the 32:16 that I'm used to on my singlespeed. As my confidence grows I may even remove the AC Racing freewheel on the other side. Hell, maybe even the rear brake! For now, though, it's just right. More importantly, it's being ridden. John Lemonius edits Totally Spoked, a site all about biking the South Downs, the chalk hills of southern England. The Kona's wheels are built on Kogswell hubs, which UK bikers can source from Hubjub. John wrote about the Kogswells last year on Totally Spoked.